Well, someone has to point it out, so I guess I'll do it. We are all seeing the news reports about the latest gun-free zone shooting: The speeches, the memes, the posts on Facebook, the pols making their case for and against gun-control, etc., etc., etc. 1) You say you oppose gun violence, but the very act of attempting to take guns from law-abiding citizens will lead to MORE gun violence, on both sides of the equation, the takers and the resisters. Are you then actually inciting and encouraging MORE GUN VIOLENCE? Is gun violence OK with you, as long as it advances your political opinion(s)? Just something you should consider. 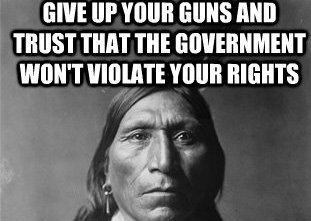 2) You say that you will not "give up your guns," but you also acknowledge that the government, or at least factions within the government, wants to take your guns, is working toward that goal, and may, in fact, one day come for your guns. Otherwise, why all the pontificating and strongly worded posts about how "no one will get my guns?" Now, having made those statements and posted those memes, what will you do if the government does, in fact, "come for your guns?" It won't be Obama or Michelle or any of your local pols knocking your door down. It will be your local police, your "heroes" or the U.S. military, your other heroes, coming to take them. You see, that's how it works. Your "heroes" are the enforcement arm of the government that you so despise. Your "heroes" will be the ones who come to take your guns. So, what will you do? Being the good, law-abiding citizen that you are will you just quietly hand them over and seek redress through the courts? Or, now get ready, because I am sure that you haven't considered this possibility, or will you resist and actually SHOOT at and attempt to kill those who would infringe on your rights? WELL?! To all of you, regarding both questions, WHAT'S IT GONNA BE? !